Should you be driving to Brussels Airport this week, give yourself even more time than usual to negotiate the tailbacks. On Friday, soil gave way at an overpass above the rail tracks in Diegem, just west of the airport, and is causing traffic delays on the A201. The subsidence also caused some infrastructure above the tracks to give way (pictured), and the A201 is down a lane for repairs. The N22 (Boulevard Léopold III) runs out of Brussels, turning into the A201 at about Nato. From there, it runs directly into Zaventem, with exits to the airport. Although rail traffic has been restored, anyone planning to drive to the airport from Brussels is advised to take the N21 (Chaussée de Haecht) or the N2 (Chaussée de Louvain) to the E40 exchange. 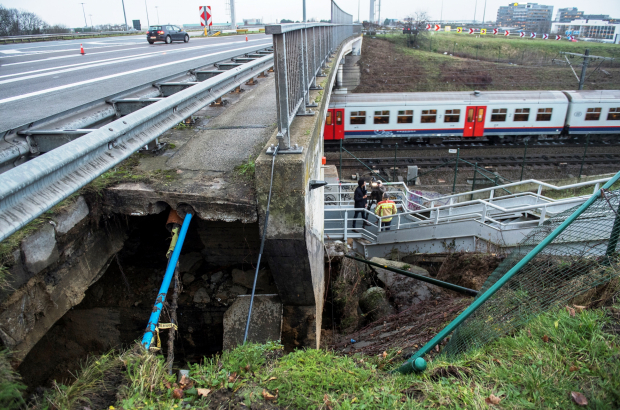 When the incident occurred on Friday, caused by collected groundwater, rail traffic between Brussels and the airport and Leuven ground to a halt. Passengers have reported missing their flights on Friday as SNCB found the situation under the overpass too dangerous and rerouted trains back to Brussels.